Shavkat Mirziyoyev the President of Uzbekistan has signed an order offering VOA to overseas travellers from 45 more nations. The Visa-free-travel will be offered for 30 days. The Presidential order for VOA becomes effective from 1 February 2019. It is among the initiatives taken by the Government for boosting tourism. It is aimed by the Government to attract 9 million-plus overseas travellers in 2025. This is also aimed at increasing the GDP share of the Tourism sector to 5% in 2025 from 2.3% in 2017. The list of nations that qualify for E-Visa system of Uzbekistan will also be expanded to 76 nations effective from 1 February. Additionally, E-Visas with 30 days validity offering double and multiple entries will be issued from 15 March 2019, as quoted by the Xinhuanet. Uzbekistan will also be offering new categories of Visas for specific groups of overseas nationals. This includes the Medical Visa, the Academic Visa, and the Student Visa. 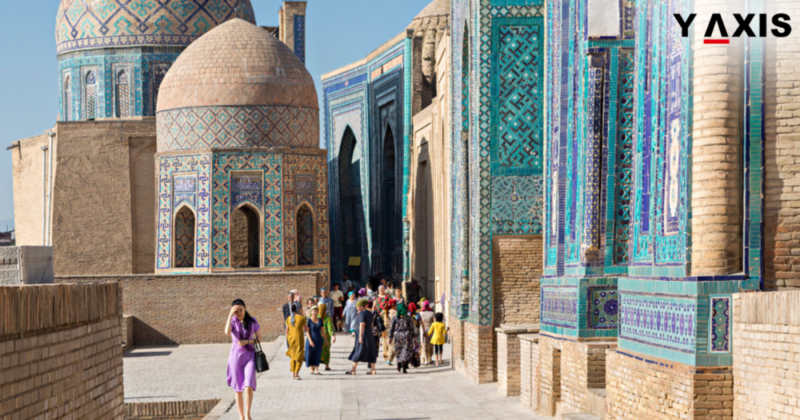 The numbers of overseas travellers to Uzbekistan reached 5.3 million in 2018. This was almost twice the numbers in 2017 according to the state tourism committee. 30-day Visa-free entry is offered by Uzbekistan to specific overseas nationals. These include the citizens of Japan, Turkey, Singapore, Malaysia, South Korea, Indonesia, and Israel. It permits mutual Visa-free travel for members of CIS – Commonwealth of Independent State. CIS is a regional association of the erstwhile Soviet Republics. If you are looking to Study, Work, Visit, Invest or Migrate to Uzbekistan, talk to Y-Axis, the World’s No.1 Immigration & Visa Company.